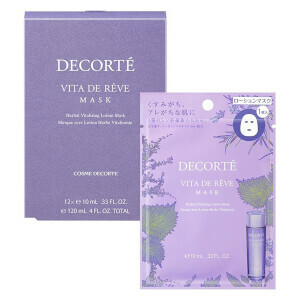 The Decorté Prime Latte Mask is a soothing sheet mask infused with a concentrated blend of fruit and botanical oils to leave the complexion feeling hydrated and replenished. Made in Japan, the 100% natural cotton mask adheres comfortably like a second skin, allowing optimal delivery of ingredients for deep and lasting hydration. Promoting softer, smoother-looking skin, the effective face mask with cushion skin's surface for a 'hydra-soft feel'. Includes 12 individually packaged masks. Water/Aqua/Eau, Butylene Glycol, Alcohol, Hydrogenated Polydecene, Glycerin, Triethylhexanoin, Ascorbic Acid, Ascorbyl Dipalmitate, Lavandula Angustifolia (Lavender) Oil, Olea Europaea (Olive) Fruit Oil, Persea Gratissima (Avocado) Oil, Rosa Canina Fruit Oil, Salvia Officinalis (Sage) Leaf Extract, Salvia Officinalis (Sage) Oil, Tocopherol, Acrylates/C10-30 Alkyl Acrylate Crosspolymer, Batyl Alcohol, Carbomer, Disodium EDTA, Ethyl Oleate, Glyceryl Stearate, Hydrogenated Coconut Oil, Hydrogenated Palm Oil, Peg-2 Stearate, Petrolatum, Sodium Hydroxide, Sorbitan Sesquioleate, Sucrose Stearate, Methylparaben, Fragrance (Parfum).